Microsoft was originally called Micro-Soft - a combination of the terms microcomputer and software. Micro-Soft opened its doors officially in 1976. A gallon of gas was just $0.59, Gerald Ford was president, and David Berkowitz was terrorizing New York City. Micro-Soft, renamed Microsoft in 1979, wasn't founded by Bill Gates alone - his high school friend Paul Allen is the co-founder of the technology giant. Microsoft also wasn't the first venture by Gates and Paul. Among other things, they created a computerized machine, called Traf-O-Data, to process data from those pneumatic traffic counter tubes you've probably driven over before. Their homemade machine wasn't the only time Gates made a mark in the traffic world. He was arrested in 1975 and 1977 for various driving violations. Microsoft didn't start out making operating systems. The company's first products were versions of a programming language called Microsoft BASIC. The popular Apple II and Commodore 64 computers used versions of Microsoft BASIC, licensed and tweaked for those devices. The first operating system released by Microsoft was actually a version of the open-source operating system UNIX. It was called Xenix and was released in 1980. Microsoft started working on Windows 1.0 in 1983 and released it in 1985. It wasn't a real operating system, however. While this very first version of Windows may have looked and acted like an operating system, it actually sat on top of the MS-DOS OS. The Blue Screen of Death, the name given to the big blue error screen you see after a major error in Windows, didn't actually begin in Windows - it was first seen in the OS/2 operating system. Considering how many devices that Windows powers, it may not be too surprising to learn that Blue Screens of Death have been seen on giant digital billboards, vending machines, even ATMs. You can even fake your own Blue Screen of Death. It's a real BSOD, but it's completely harmless. In 1994, Bill Gates purchased the Leicester Codex, a collection of writings by Leonardo da Vinci. Mr. Gates had some of those papers scanned and included as a screensaver in the Microsoft Plus! for Windows 95 CD. Bill was chosen as one of the "50 Most Eligible Bachelors" by Good Housekeeping magazine in 1985. He was 28 years old. At that time, the only other person that young to appear on their list was Joe Montana. 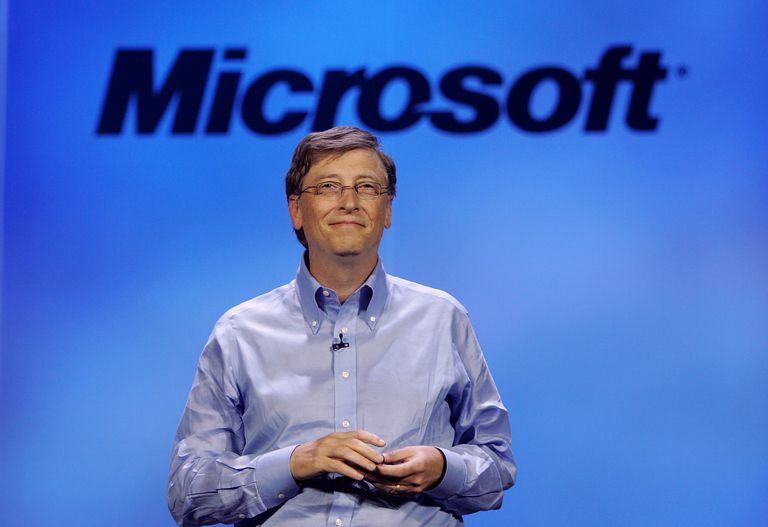 Bill Gates has been the richest person in the world, off and on, since 1993. In 1999, his net worth exceeded $100 billion USD, an unmatched level of single-person wealth, even today. Bill may not be giving his riches to people who forward an email, but he does give a lot of it away. Bill and his wife, Melinda Gates, run The Bill & Melinda Gates Foundation. They plan to eventually donate 95% of their wealth to charity. He may be King of Computers in the hearts of nerds everywhere, but Bill Gates is a real honorary Knight Commander of the Order of the British Empire (KBE), thanks to Queen Elizabeth II. Steven Spielberg is another US-born recipient of this honor. Eristalis gatesi, a fly found only in the cloud forests of Costa Rica, was named after Bill Gates. It's true that Bill Gates dropped out of Harvard University in the early '70s. However, he went for three years, technically had enough credits to graduate, and in 2007 received an honorary doctorate from the school. The MS in MSNBC stands for Microsoft. NBC and Microsoft jointly founded MSNBC in 1996, but Microsoft sold its remaining stake in the cable news network in 2012. Microsoft released Windows 7 in 2009, then Windows 8, and then Windows.... 10. Windows 10? Yep, Microsoft skipped Windows 9 completely. You didn't sleep through anything.